A full body scrub - Eco-Logic Yoga Retreat. A body scrub is done with an abrasive material like salt, sugar and/or coffee grounds, , usually mixed with massage oil and an essential oils. After the exfoliation you can enjoy a shower and the practicioner will apply a body lotion and you will be given an additional facial cucumber mask. A body scrub is not a massage, but it is really good to combine a oil massage with a body scrub. 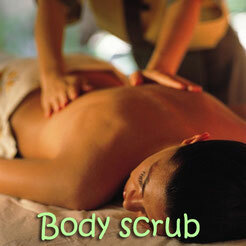 Get the body scrub first because it is stimulating, whereas the massage calms you down. Some spas have signature treatments that combine both body scrub and massage.